Spf.io (pronounced spiffy-oh) is software that enables people to access events in many languages through real-time captions and translations. It uses prepared content and live spoken speech to deliver a seamless translated and accessible experience. It’s easy to add more languages as your audience needs grow. 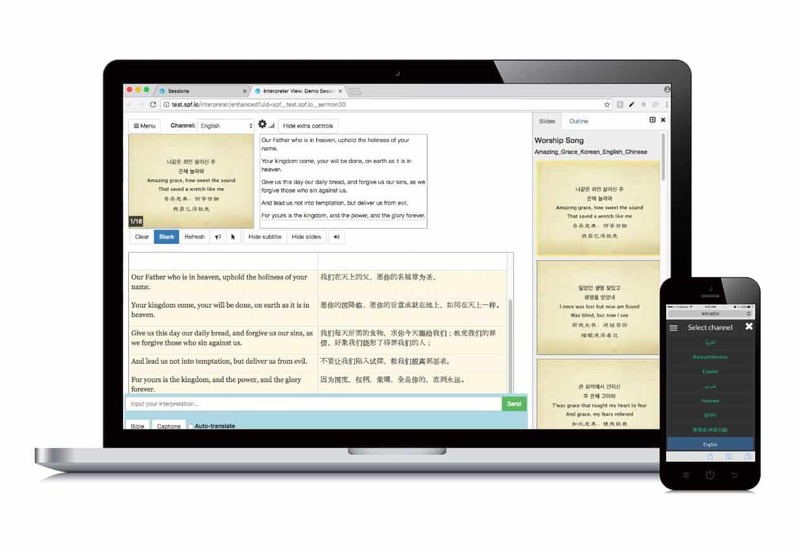 Control the display of slides and multilingual subtitles from a single device. Audience members can choose to read or listen to the translation. No wireless headsets to manage or apps to download. If you use human interpreters, audience members can receive the interpretation (both text and speech) on their mobile devices. Whether you’ve prepared a script or just have microphone audio, you can provide captions and translation for your event with spf.io. What equipment do I need for spf.io? Provide subtitles no matter how much (or how little) prepared content you have. Provide an amazing translation experience to your audience by loading your script, slides, and translations into spf.io beforehand. Load your manuscript into spf.io before the event and get it auto-translated with the click of a button. No manuscript? No worries! Just plug the microphone audio into a computer running spf.io and monitor the live captioning/translation. Get started today and start reaching your audience better than ever before.